The Vampire the Masquerade: Bloodlines 2 announcement trailer. All grown up and ready to feed. Vampire the Masquerade: Bloodlines 2 now on pre-order for Steam. I admit to surprise: I hadn’t realized that Paradox already had the DLC for Vampire the Masquerade: Bloodlines 2 lined up and everything. It would seem that the company is pretty good about keeping secrets, because I never heard a word about this sequel until today. And I would have absolutely started looking for news about it if I had been given even a hint. Anyway: coming out in March 2020. Just in time for my fiftieth birthday! Yay! …And, yay. VAMPIRE: THE MASQUERADE – BLOODLINES 2 COMING OUT IN 2020. The original Vampire: The Masquerade – Bloodlines was released 15 years ago. On top of an absolute mouthful of a title, it was one of the best RPGs of its time, a memorable, heady mix of vampires and Los Angeles crime. It was also the epitome of a cult classic, which is to say it reviewed well but sold poorly. So it’s both a massive surprise and a welcome one that Vampire: The Masquerade – Bloodlines 2, a full-fat, also-a-mouthful sequel, was announced at GDC last night. It’s real, folks, and it’s scheduled to release in early 2020 for PS4, Xbox One, and PC. Bloodlines 2 will take the series to a new city, Seattle, and expand upon the vampire society that made the first game great. You play as a young vampire who was forcibly turned as part of a taboo “Mass Embrace,” and who must now learn to navigate a bloody political landscape. I never dared hope for a sequel. I was almost afraid of one. But this… this is awesome. While… :checking: …yup, still almost afraid of it. What if it’s not as good? In the Mail: The Slipcover Vampire: The Masquerade. This is the one Ken Hite edited. And it is, to use a word, lush. *I would absolutely play in a reverse M:tA campaign where I was a Void Engineer trying to cure the excesses of both my own side and that of the Nine Traditions. I’d also like a pony and eternal youth, so that I could actually have time to play in such a campaign, and a way to get there. So, yeah, I grabbed 5E Vampire: the Masquerade. To quote Charlie Stross: I failed my save vs. shiny roll and picked up the VAMPIRE: THE MASQUERADE, SLIP CASE SET. They set it up pretty slick, too. Pick up the core book? No problem! Hey, here’s one of the two supplements. Oh, look at that price; well, to be expected. Only… it’s only a little bit less than the three-supplement-and-slipcase option. Hell, they’re practically giving you the third book, when you think about it. …Crud. Where’s my credit card? Or, in this case: where’s my PayPal account? Oh, well, at least I’m helping to keep Ken Hite solvent. That’s not the worst thing in the world to do with one’s money. Choose the form of the Destructor: the new Vampire: The Masquerade is up for preorder. [Expletive deleted], [Expletive deleted], [Expletive deleted]-y [Expletive deleted]. This is bad, man. This Vampire: The Masquerade preorder has tiers. Tiers are dangerous. You start off at the lowest one, and you figure that this is fine — and then you start looking at the higher tiers, and realizing that all you need to do is put in a little more to get a good deal on something that you’re going to get anyway. And there’s your new baseline, neighbor. It all ends with you trying to explain to your wife why you spent eight hundred bucks on a limited edition hardback with leather covers and hand-written pagination. I’ll tell you the answer. It’s because you are weak. And because this version of VtM is Ken Hite’s baby, and it’s going to help feed his book habit. And, yeah, because it looks so very, very pretty. The signup for the notification of the preorder of Vampire: The Masquerade 5th edition. You can sign up here. Pre-orders of the Fifth Edition of Vampire: The Masquerade start Saturday April 28th; those books will ship in August. I have signed up to be notified of the reminder to pre-order, with absolute good will on my part: Ken Hite is the Lead Designer for that product, so let me just go get my credit card out. It’s much simpler that way, really. PS: No, no Kickstarter. Apparently they don’t need the funding. Or the built-in early order infrastructure. Vampire: The Masquerade Fifth Edition in pre-alpha playtest. Interestingly, White Wolf is downright eager to have people take a look at the pre-Alpha ruleset. They’ve made it available for download here, and want players’ and GMs’ feedback prior to the Alpha playtest (starting in August). 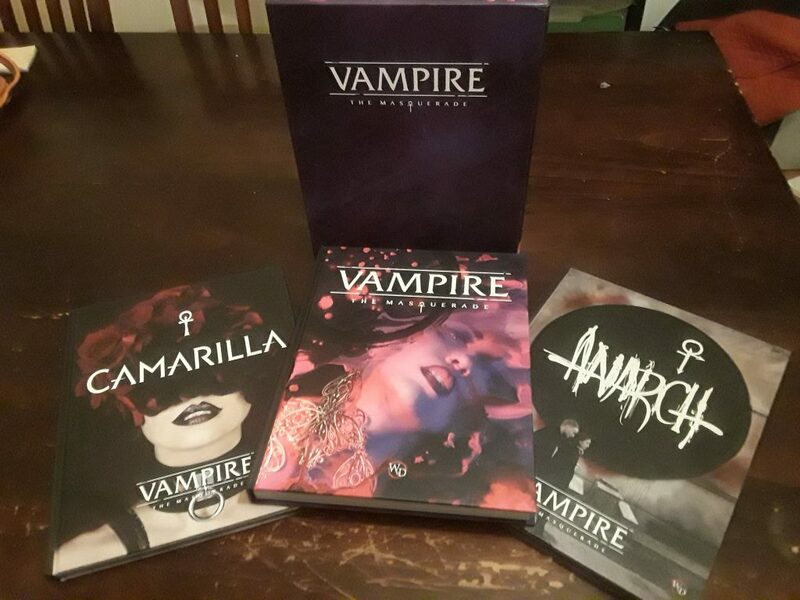 Of course, when you have a title like Vampire: The Masquerade, you can be reasonably certain that people are going to buy your latest edition, usually while actually throwing their money at you in their haste to get their hands on The Precious. …Yes, I should have come up with something that was more World of Darkness there, but I had wicked insomnia last night and I’m kind of loopy right now. PS: Yup, I’m thinking of running the adventure. Either online, or with my players. Tough call. @kennethhite will be Lead Designer for the new Vampire: the Masquerade. Hey! Vampire: the Masquerade is now on Humble Bundle! Cheap, too.